£23bn goes up in smoke! 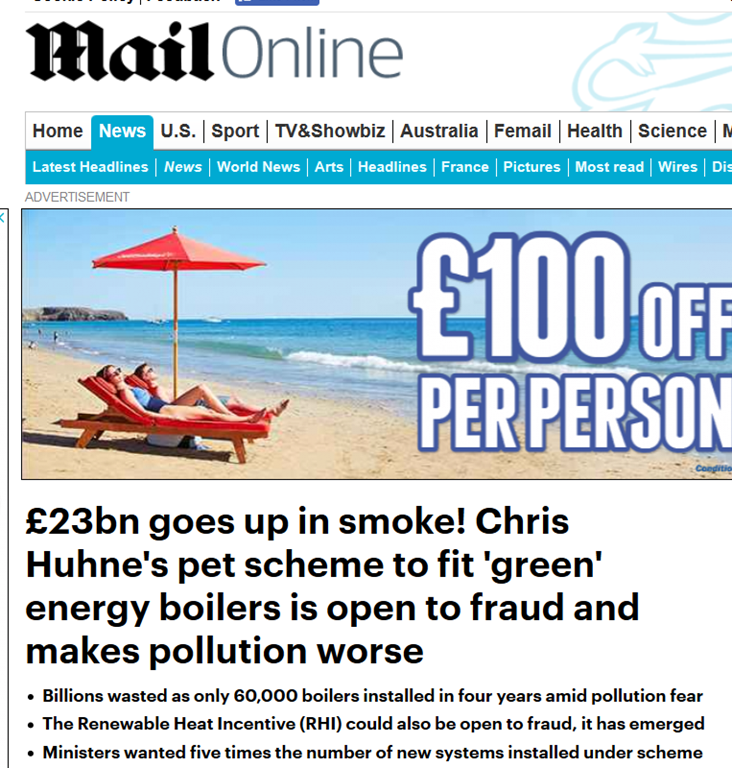 Chris Huhne’s pet scheme to fit ‘green’ energy boilers is open to fraud and makes pollution worse! Harrabin rather glossed over the report by the Public Accounts Committee on biomass boilers, in his article today. ‘The Department and Ofgem do not understand the impact on air quality of installations funded by the RHI,’ the report concluded. ‘Air pollution from sites funded by RHI is a serious public health issue. The regulator Ofgem is meant to monitor the emissions and ensure biomass boilers pumping out too much smoke should not attract taxpayer payments. But the MPs said these checks were not being carried out. The committee outlined two examples of fraud or ‘gaming’, where people generate heat but not in the spirit of the rules. The MPs said some are ‘using heat generated under the RHI to dry wood, waste or other materials to then feed back into the boiler to burn it again’. The second way involved ‘the use of multiple boilers to take advantage of more generous tariff rates’. Officials and Ofgem were aware and had taken action, added the report. Mr Huhne also introduced another unsuccessful environmental initiative, the Green Deal. The take-up for this scheme offering loans to install energy efficient insulation was ‘dismal’, the MPs said. Just 5 per cent of the loans forecast to be made were handed out. The RHI was at the centre of a green energy scandal in Northern Ireland which cost the taxpayer close to £500million. Firms were paid subsidies to switch to renewable heating which were higher than the cost of the fuel, leading them to burn resources needlessly. By pure coincidence, Huhne is now Chairman, Europe of Zilkha Biomass Energy, a US company producing of wood pellets for wood stoves. According to Zilkha, Huhne’s has the remit of growing the business in the European Union. For some reason, Harrabin forgot to mention any of this. One suspects that such corruption is very widespread in Green organisations, pressure groups and fake charities and individual “clean green” promoters, parliamentarians, media reporters, especially BBC, some commentators, some scientists, renewables pushers and landowners. Therefore, the green climate blob is riddled with corruption, which keeps it all going. The EU , a corrupt outfit like all multinational bodies will be likewise motivated. How – how – did a part of the government put in place a scheme whereby people were paid more to burn stuff than the stuff costs to buy? We actually have a government in NI that paid people to burn things. In order to reduce pollution and to save the Earth. It’s like BP charging people £1/litre of petrol and giving them £1.20/litre to fill up. To be Green. As commented at the Mail, Huhne should still be behind bars. The Government should open a penal colony somewhere in the Shetlands (say) for all the corrupt people behind the climate change and renewables scams. Maybe the likes of Huhne and all the other government miscreants should be invited 😉 to go on a continuous environmental study of St. Kilda. While they’re there they could also be tasked with cleaning the military buildings and masts. You are referring to the South Shetlands aren’t you? What have the current inhabitants of Shetland done to have Huhne dumped on them? South Georgia would be better. Like most other government incentive schemes, a complete flop. Part of the problem being, of course, government officials have no concept of a good deal – as in a commercial business offering competitive products on the open market. They must compete favourably, indeed, offer substantial benefits over conventional offerings to overcome user inertia and risk aversion. As usual, the ones to take advantage of favourable change are usually the wealthy who can stand the up front costs. Not that biomass boilers are a favourable change, far from it, they are environmentally damaging in every way. Why anyone in their right mind would convert from accessible, clean, convenient, cheap gas/electricity to a system as inconvenient, damaging, and expensive as biomass for reasons other than virtue signalling, defeats me. In the case of Northern Ireland #cash4ash the blithering eejits wouldn’t / couldn’t see that the subsidies were over generous and as I understand it refused to investigate while the berks responsible were moved upwards and sideways…. still going on isn’t it? As I’ve railed here previously – the ofgem RHI schemes (certainly the one over a certain size) are all publicly databased – but that database has been conveniently broken for some time. I’d bet that the subsidy payments accounting is run like the Rural Payments Agency where the twerps couldn’t find their own backsides in a darkened room with both hands. Worse, he’s a politician, they get away with it, crook’s don’t. The problem with Government Ministers and officials is that they have never been in business and learned the importance of making profit and spending money wisely – logic that is vital for any successful business across the country. They simply live off the public purse, which is money, collected in taxes from successful businesses providing employment for the population, and the only income for governments. They generally do not know that working hard to make a profits or sensible investments is the all important key to a company’s survival .and growth.. The same applies to those at the top of the teaching profession, the health service and local governments who all take their high salaries from the taxes paid by successful businesses. MPs and government officials can be responsible for making decisions that result in huge losses to the government but rarely suffer for their sometimes multi-billion mistakes, as in Hurns case. Our governments are now being made up from professional politicians with little experience of business other than running their local political party,.and when they are elected as the local MP, those with the loudest voice will be promoted to oversee major projects way outside their ability to meet what the project demands. Hurn is the prize example of this sad situation. Up until the second half of the last century those who stood to represent their local constituents in parliament were successful businessmen, some employing thousands of their constituents, who gave their services for altruistic reasons, for the good of the Country and for which they were not paid a salary. The current American President is the prize example of what we need in this country, a leader who has vast experience of running a successful business. His business acumen and simple logic will see him put The USA back on the map of successful countries, and in doing so he will go down as one of the most successful presidents of all time. The arrogance of the BBC environmentalist politburo was on display yesterday on R4 Costing the Earth, about the recent decline of the rabbit population in the UK due to disease. Farmers were allowed to speak, saying how good it was to have fewer rabbits, but then the environmentalists passed their unquestionable verdict and the remaining commentary was only about how terrible it was that a species should decline. This arrogance is shown regularly in the total failure to question the cost and effectiveness of measures to “save the environment”. Plenty of rabbits round here! And they were cleared out by the local farmer about three years ago. They have a certain charm to look at but they are pests unfortunately. However from what I heard this afternoon on Radio4 those that are/were gaming the system were not breaking the law as the rules were so lax. Some may remember that I commented before that I received “letter of the month” prizes about 5 years ago from the two main selfbuild magazines. I referred to RHI as the RH insanity, which made feed-in tariffs look almost sane. Of course I was berated as one of those deniers. A few years ago, iIt was noted by me and more than a few others that, Australia did have a policy of strapping the taxpayers of the southern island continent in similar vein – all to do with that tired old cliche sustainability and the green agenda, ie, insulating houses and installing other green (boilers) stuff, I’m sure there are lads (from down under) who contribute on here who’ll know the details better, far better than lil ole me. The Australians quite sensibly binned their great green rush and that was some two or so years (??) ere Miliband’s (should I say Bryony’s) act of treachery and hence, implemented by the demented – Dave’s Tories and the ilLiberal lunatics. 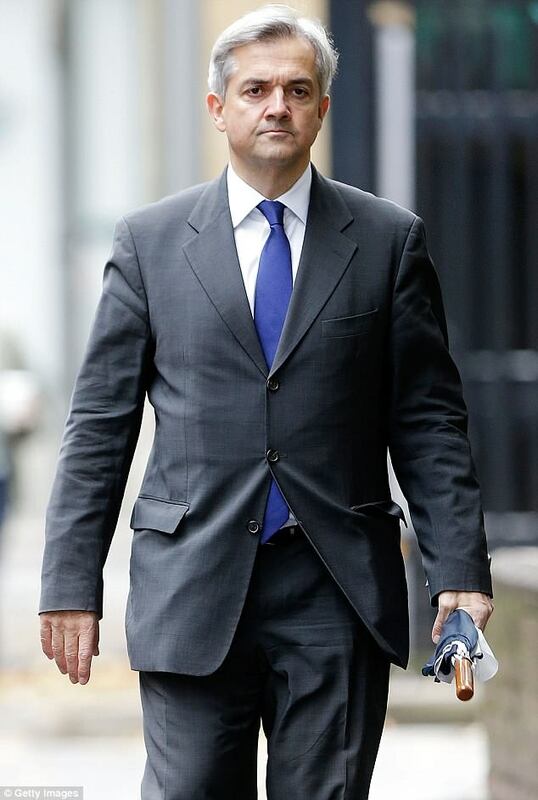 Enter Chris Huhne. Now call me forgetful (again) but didn’t a similar scheme (to the Aussies) go down the chute in Spain? Thus two schemes of very similar ambition but dropped. We beseech, what made our lot the UK government believe that, they could do any better? Furthermore do they not say (Einstein) that, repeating the same experiment and expecting different results, is the very definition of insanity. But hey….goverment schemes and ‘saving money’ – (think ‘smart meters’) it’s not their money is it? Madness and the green agenda, they ride in tandem. Huhne, Huhne, where have I heard that name before? That’s three news stories of green energy madness in one day! What will it take for the people to understand that Environmentalists do not act in the best interest of humans? The conservation movement has been taken over by Socailists, Marxists, and carpetbaggers (but I repeat myself). So Huhne is still actively involved in lying and fraud. What no-one mentions is who is going to resign, be sacked, impeached, prosecuted for this entirely predictable fiasco? And whether this scheme will be scrapped forthwith? No need to worry about the air pollution that is being produced by wood burning stoves. Just tax diesel vehicles off the road and it will be sorted. Unclear how MPs can criticise the low uptake *and* the fraud and pollution generated by the scheme. Given the latter, surely the former is a good thing. And now a word from the “meow” corner. With all of his ill-gotten gains, you might have expected a better looking, better fitting suit than the picture exposes.